The 2018 RallyX Nordic presented by Cooper Tires Supercar title will be decided this weekend [6-7 October] with Oliver Solberg, Oliver Eriksson and Thomas Bryntesson primed for a three-way battle at the brand-new Tierp Arena rallycross track. With five of six rounds completed, Solberg heads into the much anticipated season finale armed with a six point margin over closest rival Eriksson with Bryntesson firmly in the hunt 12 points adrift of his fellow Norwegian. In Supercar Lites, Guillaume De Ridder faces off with Ben-Philip Gundersen for the overall crown. 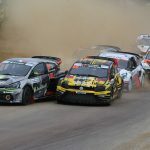 Setting the stage for this Swedish showdown is the Tierp Arena’s newly-constructed rallycross track, which makes its debut on the RallyX Nordic calendar to conclude the season. With a carefully-crafted layout designed with drivers and spectators in mind, the 1394m track’s distinguishing trio of jumps, tight Arena hairpin and use of gravel corners have all come in for praise by RallyX Nordic competitors. Having only recently celebrated his 17th birthday, Solberg is the youngest of the three title contenders, yet remains the man with a target on his back as the only driver to have won more than once this season in his OSRX Citroen DS3. 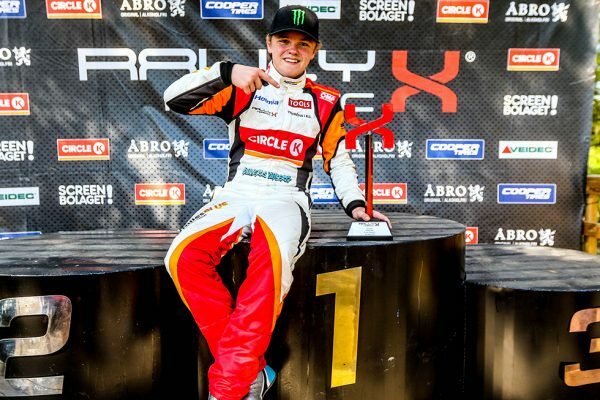 Victories in Arvika and Grenland – the latter yielding a career-first perfect score – have seen Solberg steadily assume control of the title battle in a hugely successful second season of RallyX Nordic competition that has captured headlines around the world. Heading up the competition is Olsbergs MSE driver Oliver Eriksson, who has become an increasing threat to Solberg over the season and arrives in Tierp on the back of a confidence-building victory last time out in Kouvola. Dovetailing his RX2 International Series commitments – where he is also a title contender – with a chance to secure his maiden Supercar title, 19-year-old Eriksson is hoping momentum and home support will give him the edge. Defending champion Bryntesson cannot be discounted either as he bids to hold onto his #1 plate for JC Raceteknik. Bryntesson won the Holjes season opener and has matched – if not exceeded – the pace of his two rivals elsewhere, only for poor fortune at critical moments to take their toll. Nonetheless, he remains confident he can turn it around when it matters. As well as contending with one another in Tierp this weekend, the title rivals will also have to go up against arguably the strongest Supercar line-up of the season in what is set to be a spectacular conclusion to 2018. In addition to regular front-runners Peter Hedstrom (Hedstroms Motorsport), Ola Froshaug (JC Raceteknik), Andreas Carlsson (AC RX) and Daniel Thoren (Hedstroms Motorsport), Lukas Walfridson makes a welcome return in the Helmia Motorsport Renault Clio, as does Eklund Motorsport’s Philip Gehrman. Both drivers have stepped on the podium in 2018 but will be looking to top it for the first time this weekend. After his headline-grabbing run to victory on home soil in the final at Nysum, Ulrik Linnemann is back to continue that winning feeling in Sweden this weekend. This time, however, the Dane swaps his venerable Volkswagen Polo for a Honda Civic in what will be the car’s European competition debut. 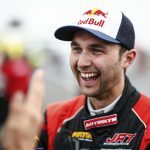 Meanwhile, World RX regular Robin Larsson will be chasing victory in an Audi A1 as part of a 14-strong Supercar entry list brimming with high quality contenders.